A humble attempt at keeping tabs on Federal Government and highlighting the best in accountability journalism. More links, less pontification. Welcome back to another abbreviated edition of the Watchdog One weekly, by Jason Mojica. Please make sure to follow us on Twitter: @watchdog_one / Tell your friends to SUBSCRIBE / Send us tips: tips@watchdogone.org / Let us know what you think: editor@watchdogone.org. Welcome back to an abbreviated edition of the Watchdog One weekly, by Jason Mojica. Please make sure to follow us on Twitter: @watchdog_one / Tell your friends to SUBSCRIBE / Send us tips: tips@watchdogone.org / Let us know what you think: editor@watchdogone.org. Seeming to presage that the president would talk about the need to crack down on “dealers and pushers” in his SOTU, on Tuesday, Jeff Sessions announced a “surge” of DEA Special Agents, Diversion Investigators, and Intelligence Research Specialists to crack down on prescription drug diversion. For the next month-and-a-half these folks will “focus on pharmacies and prescribers who are dispensing unusual or disproportionate amounts of drugs.” To do this, the DOJ says it will utilize data from approximately 80 million transaction reports it collects every year from prescription drug manufacturers and distributors. We’re curious how the DOJ will define “unusual” or “disproportionate,” so we asked. However, the agency did not respond to our request for comment. – Here’s Mulvaney’s original email to CFPB staff [Watchdog One]. Welcome back to the Watchdog One weekly, by Jason Mojica. Please make sure to follow us on Twitter: @watchdog_one / Tell your friends to SUBSCRIBE / Send us tips: tips@watchdogone.org / Let us know what you think: editor@watchdogone.org. Visiting Warsaw on Saturday, Secretary of State Rex Tillerson continued to hold Russia accountable for the use of chemical weapons inside Syria. Earlier in the week, Tillerson laid out his case in Paris, after signing on to the International Partnership Against Impunity for the Use of Chemical Weapons. “The 22 agencies being evaluated were asked to identify all of their IT contracts while GAO created an independent list of the agencies’ IT contracts. The agency-provided total was 76,599 contracts worth $14 billion for FY 2016, while GAO found 108,092 worth $18.5 billion. That means 31,493 IT contracts worth $4.5 billion were not being flagged for the FITARA oversight process. The Department of Justice and the Department of Homeland Security released a joint report on Tuesday that claimed, among other things, that approximately 73% of individuals convicted of international terrorism charges (emphasis added) in US courts were foreign-born. This is kind of like saying that most Japanese cars are made in Japan. Still, President Trump ran with it, making an official statement that “nearly 3 in 4 individuals convicted of terrorism-related charges are foreign-born” and connected the stat to the need for immigration reform. Steven Aftergood, Director of the Federation of American Scientists Project on Government Secrecy, noticed this week that the Director of National Intelligence recently updated its procedures for dealing with leaks of classified information. Most notably, Aftergood points out that, “It presents an expansive definition of an unauthorized disclosure that includes not simply disclosure but also the ‘confirmation’ or ‘acknowledgement’ of classified information to an unauthorized person.” The directive also lays out a three-tiered hierarchy that advises on how and when agencies should engage the DOJ once a leak has occurred. A DOT audit found that people responsible for sensitive information don’t know what information is sensitive. The Trump administration started the week by ending Temporary Protected Status (TPS) for roughly 200,000 Salvadorans living in the US, and ended it with the President calling their country a shithole. It’s not like Salvadorans helped rebuild the Pentagon or anything. The Justice Department announced on Tuesday that it had revoked the naturalized US citizenship of a New Jersey man– the department’s first denaturalization as part of its Operation Janus, which targets individuals who shouldn’t have been able to successfully secure citizenship in the first place due to having been deported or removed under another identity. The final border apprehension numbers of 2017, specifically at the southern border, undeniably prove the effectiveness of President Trump’s commitment to securing our borders. This administration has overseen a 40 percent decrease in 2017 compared with the last year of Obama’s presidency. US Border Patrol apprehensions in Fiscal Year 2017 were at the lowest level in 45 years. The significant increase over the last month in the number of family units and unaccompanied children coming across the border illegally highlights the dire need for Congress to immediately adopt responsible pro-American immigration reforms. – So which is it? Is Trump’s master immigration plan leading to a decrease in border crossings, or an increase? As Tal Kopan reports at CNN, the answer is: yes. – A CPB officer was sentenced to prison on Wednesday on one count of conspiracy to transport aliens within the United States. A DOJ release said that US District Judge Micaela Alvarez “noted that one of his specific job responsibilities was to ensure that individuals who were not authorized to come into the U.S. were prevented from doing so, and he did the exact opposite.” Read more from the DOJ here. Here’s how folks in the House voted Thursday on reauthorizing FISA. Send your cheers or jeers to your member of congress accordingly. Growing up watching the teevee, most of us have a romantic idea of what listening in on the bad guys looks like. Maybe it’s a former industrial space converted to a high-tech listening post, or maybe its a massive government facility filled with super-nerds. In reality, it’s more likely that this work is being done at an anonymous suburban office park near you, and by third-party government contractors. The quality of the work being done on one of those contracts and the degree of oversight the Drug Enforcement Agency maintained over it is the subject an audit published on Thursday by the Office of the Inspector General (OIG) at the Department of Justice (DOJ). The contract, which had a $135mm ceiling, was one of two awarded to Conduit Language Specialists in 2012. The job was to provide analytic linguist services for the DEA’s Denver and Phoenix Field Divisions – which primarily involves listening in on and translating Title III wiretaps that are used in Federal criminal investigations. The OIG found that the DEA allowed some of Conduit’s linguists to work on the sensitive contract without completed background investigations or signed non-disclosure agreements. In addition, the OIG found that Conduit allowed some linguists to work on the contract without required language proficiency test results, and that the DEA spent almost $2.9mm in taxpayer money on linguists that didn’t meet this prerequisite. 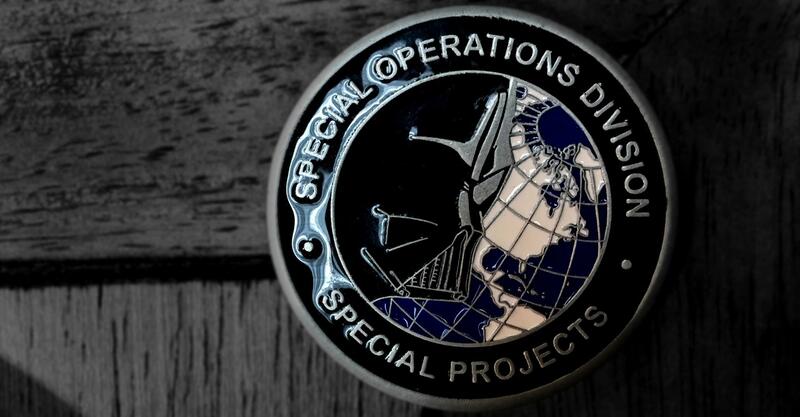 Human Rights Watch published a 77-page report this week on the “secret origins of evidence in US criminal cases,” with a special focus on the DEA’s Special Operations Division (and its Darth Vader challenge coin). Read the full report at HRW. With the diplomatic breakthroughs between North and South korea coming fast and furious, the US State Department’s Heather Nauert issued a statement saying that the US “welcomes” the meeting between the DPRK and the ROK “aimed at ensuring a safe, secure, and successful Winter Olympics in Pyeongchang.” The statement goes on to remind everyone that the ROK is on the hook for making sure that North Korea’s participation in the games doesn’t violate sanctions, which means no Nike swag bags for the North Korean delegation. What would be even more useful than a statement from a State Department spokesperson would be if the US Ambassador to South Korea could chime in directly… except that there isn’t one. – US Ambassador to South Korea is just one of 245 positions that President Trump currently has no official nominees for. James Hohmann at the Washington Post breaks them all down. Dan Lamothe in The Washington Post profiles Marine Col. Scott Jensen, whose efforts a few years back to combat online misogyny, harassment, and retaliation within the military died a death of a thousand bureaucratic cuts. This week he’s been announced as the CEO of the nonprofit Protect our Defenders, which will give him a chance to continue to push for reform, but from the outside. The move effectively puts Jensen in a position in which he will be speaking out against some of his old bosses. Private prison outfit GEO group, who gave generously to the Trump campaign and hired two of Jeff Sessons’ former aides as lobbyists, was not able to make an Equal Employment Opportunity Commision (EEOC) lawsuit go away. Or rather, the EEOC announced this week that it’s going to cost them $550,000 to settle the suit, which alleged sexual harassment and retaliation at two of GEO’s facilities. Can a newsletter be in beta? Well, this one is. Welcome to the inaugural edition of the Watchdog One Week in Review. We hope that you enjoy this humble attempt to keep tabs not on what politicians are saying, but what the Federal Government is doing. What you’ll find here on a weekly basis is a mix of the esoteric hidden-in-plain sight information that the US government makes available to those who look for it, and highlights from the best accountability journalism being done today. What you won’t find is a rehash of the latest political mini-scandal to dominate the headlines. “Secretary Zinke Announces Plan For Unleashing America’s Offshore Oil and Gas Potential” screamed the headline on a Department of the Interior press release that would make Kim Jong Un’s press shop envious. The release explains that the draft proposed program would “consider nearly the entire U.S. Outer Continental Shelf for potential oil and gas lease sales.” Secretary Zinke said in the release that this will provide, “billions of dollars to fund the conservation of our coastlines, public lands and parks.” If you think this sounds like a good idea, you can share your thoughts with the Bureau of Ocean Energy Management online starting Jan 8, or at one of the public meetings being held around the country starting Jan 16. – Ten Governors from coastal states have already come out in opposition to the plan, including Florida Republican Rick Scott who said in a statement, “I have already asked to immediately meet with Secretary Zinke to discuss the concerns I have with this plan and the crucial need to remove Florida from consideration.” Read more here. – Meanwhile, a 9¢ per barrel tax on oil that helps fund oil spill cleanup lapsed on Jan 1. The Washington Post Reports that, “although GOP leaders opted not to renew the tax in December, they are considering reinstating it retroactively in an “extenders” bill that would revive several recently expired taxes. Industry officials noted that the U.S. Coast Guard or the National Oceanic and Atmospheric Administration could always ask Congress to reimpose it if either felt it was needed.” Read more in the Washington Post. It was a snowy, short week in Congress, with just the Senate in session. They swore in Democrats Doug Jones of Alabama, and Tina Smith of Minnesota, and took just one vote: confirming ex-Lockheed executive John Rood to as undersecretary of Defense for policy with 81 yeas and 7 nays (Sanders, Warren, Wyden, Booker, Gillibrand, Harris, and Markey), in spite of a bit of sparring that occurred during his confirmation hearing in November. File under: Things We Didn’t Know Were a Thing. The Department of Defense on Tuesday awarded a $33mm contract to Lockheed Martin to continue supporting South Korea’s “Peace Krypton” system: a private jet retrofitted to conduct aerial reconnaissance over the DPRK. While the U2 missions that are still being flown out of Osan Air Base tend to capture the attention of visiting news crews, the Peace Krypton flights have been operating without much fanfare since 1996, when Lockheed first won the contract. The optimistic-yet-ominous sounding Peace Krypton is actually a Raytheon Hawker 800XP business jet, modified to carry a wide range of imagery intelligence and signal intelligence dodads that we won’t pretend to understand. On the homefront, this means about 30 people in Colorado Springs get to keep their jobs. That was the exclamation that kicked off the Department of Homeland Security’s Blue Bulletin for January, reminding you that Jan 11 is #wearblueday to raise awareness and help #endtrafficking. More info about the Blue Campaign here. – Emily Mills at The Marion Star has more background on the trafficking case, which goes back to 2013. Or you could curl up with a scintillating, just-published data set from the Federal Government. Earlier this week, the State Department published the 35th edition of World Military Expenditures and Arms Transfers. It’s a fascinating data set that reveals, among other things, the countries that have the highest military burden, as defined by the ratio of military expenditures to GDP. The good news is that worldwide that burden is currently about 2-2.5%, down from its high at the end of the cold war of 4.7%. FEMA’s decision to expand the pool of those eligible to receive federal funds comes after the most recent report from the Department of Homeland Security Office of the Inspector General (OIG) said that FEMA failed to heed previous recommendations from the OIG, and has wasted billions of taxpayer dollars. Republican Senator Cory Gardner took to the Senate floor Thursday to denounce the new pot policy (video), saying “I will be putting a hold on every single nomination from the Department of Justice until Attorney General Jeff Sessions lives up to the commitment he made to me in my pre-confirmation meeting with him. The conversation we had that was specifically about this issue of states’ rights in Colorado. Until he lives up to that commitment, I’ll be holding up all nominations of the Department of Justice.” Read more at CNN. Andrew Bergman and Toly Rinberg at the Sunlight Foundation just published a compelling breakdown of how the Trump administration has reduced the amount of public information available online in its first year, replete with side-by-side comparisons. They report that, “the most significant reduction in access to federal resources occurred at the EPA when its climate change website was removed on April 28, 2017. This is only part of the censorship of climate change Web content that has gone on at the EPA and across federal websites. The site has been down, without a legitimate explanation for more than eight months. A portion has been returned, but with mentions of climate and almost all climate Web resources removed.” Read more and see the examples over at the Sunlight Foundation.